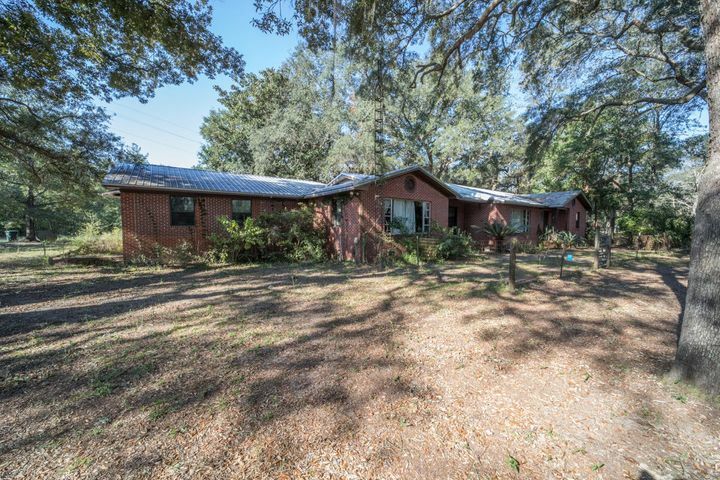 This charming rare brick home is nestled among live oaks on over 2 acres! It offers 2992 square feet on one floor, and it features a metal roof (2010), hardwood and tile floors throughout, gorgeous wood plank ceilings in 2 of the bedrooms, and a 2-car garage. Your guests will love the oversized rooms in the 1100+ square foot apartment which includes a kitchenette, living room, and huge 23x20 bedroom. You'll also own a piece of history with the original Red Bay Post Office being on the property. Septic for main home is 4 years old and the well pump is 2 years old. Newer windows, new Kinetico water softener. Zoned commercial, it has a separate septic system and plenty of space to add an office/store. Just 10 minutes to I-10 and 30 minutes to the sugar sand beaches of the Emerald Coast! © 2019 Emerald Coast Association of REALTORS®, Inc. (ECARMLS). The information being provided is for consumers personal, non-commercial use and may not be used for any purpose other than to identify prospective properties consumers may be interested in purchasing. Information is believed to be accurate but is not guaranteed. Data last updated: Friday, April 19th, 2019 06:46:38 PM. Listing courtesy of Berkshire Hathaway Home Services.